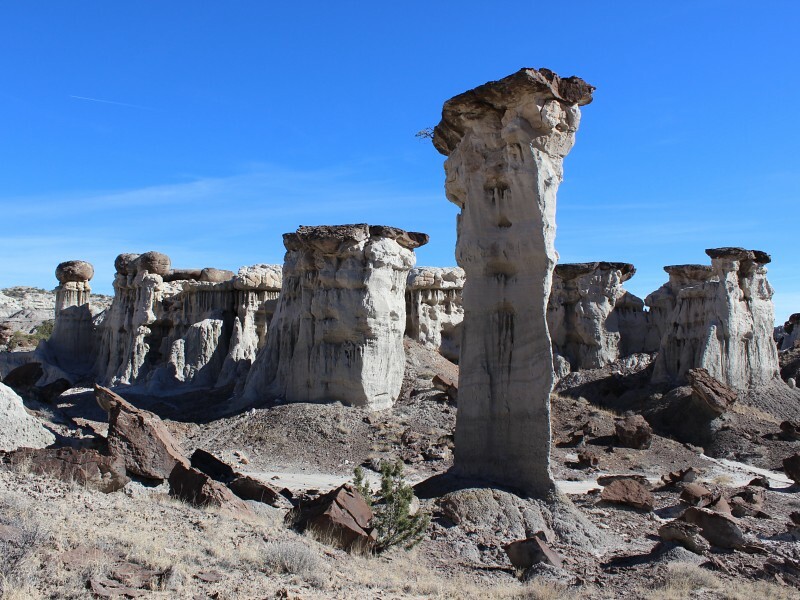 Managed and protected by the Bureau of Land Management, the Lybrook Fossil Area (commonly referred to as the Lybrook Badlands) lies in the Nacimiento sedimentary layer, which is approximately 65 to 55 million years old (Paleocene Period). 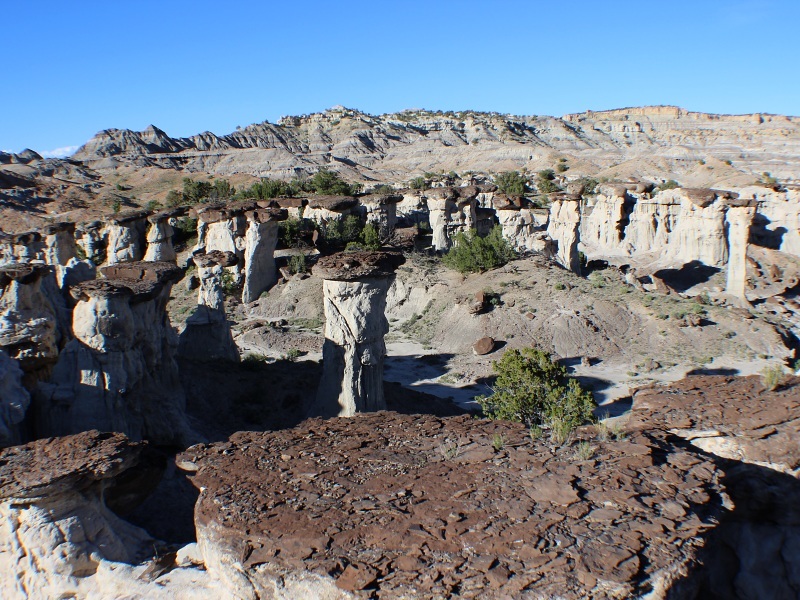 Its box canyon and riddled mesas drop over 700 feet in elevation with distinct, multi-colored, eroded stair steps. 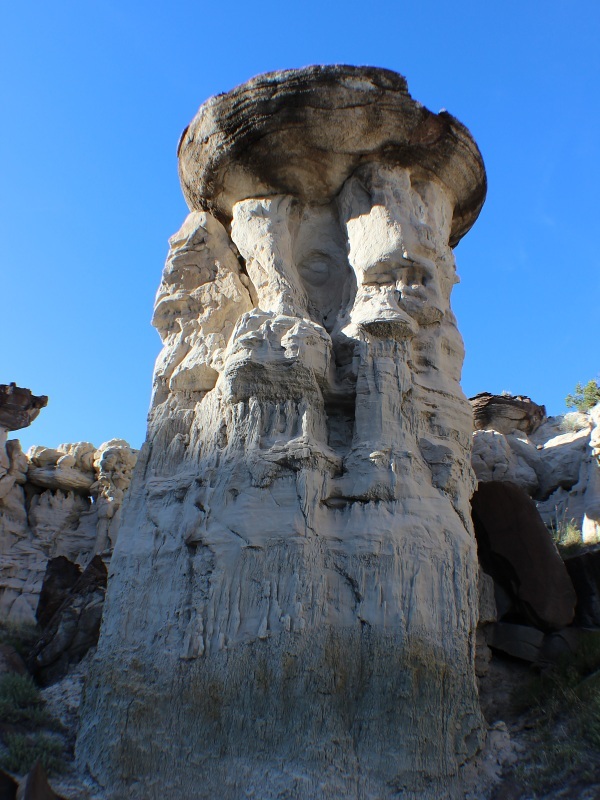 Through time and erosion, a fantasy world of strange rock formations have been created which for the imaginative mind can lend to some interesting shapes and "characters" provide ample content for the photo enthusiast. 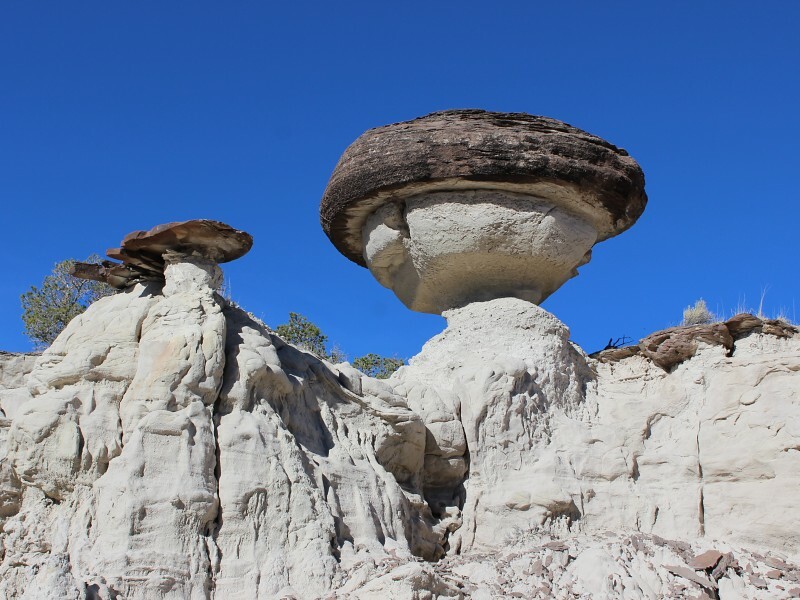 Most commonly found in the badlands are clay domes, hoodoos and oddly shaped features. 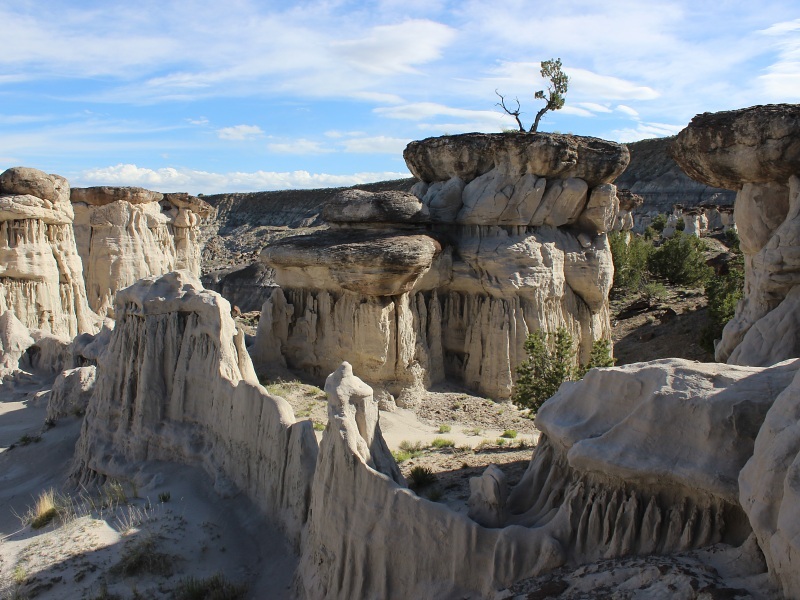 The hoodoos within the Lybrook Badlands tend to be taller and more massive than the hoodoos found in the Bisti or Ah-shi-sle-pah areas. The terrain is also more rugged with steeper slopes and ridges. Seventy million years ago, this area was covered by a shallow sea and coastal swamps. What remains can be seen in the black layers of coal formed by plants and animals that died, sank into the mud, and turned to rock. You are welcome to look at any fossils of plants and animals that you find, but it is illegal to remove them from the wilderness. At the end of the Cretaceous Period the seas withdrew and the dinosaurs disappeared. The seas left behind a flat plain, a layer of sandstone over soft shale and mudstones. Between 50 and 30 million years ago the Rocky Mountains rose to the north and east and other mountains to the west. As the rain washed down from the mountains, it wore away the sandstone, cutting through to the softer layers beneath. 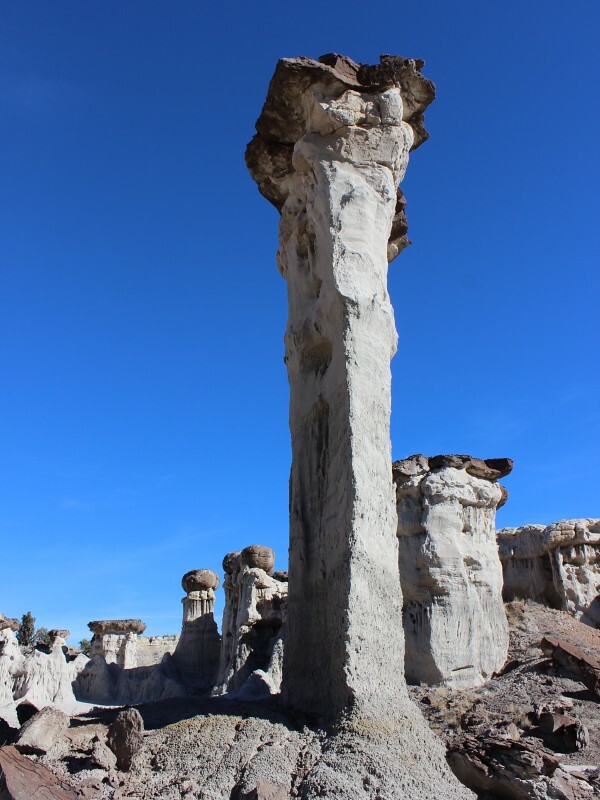 In some places, pieces of sandstone remained, protecting the layers below form the rain and water, and forming column-like "hoodoos". 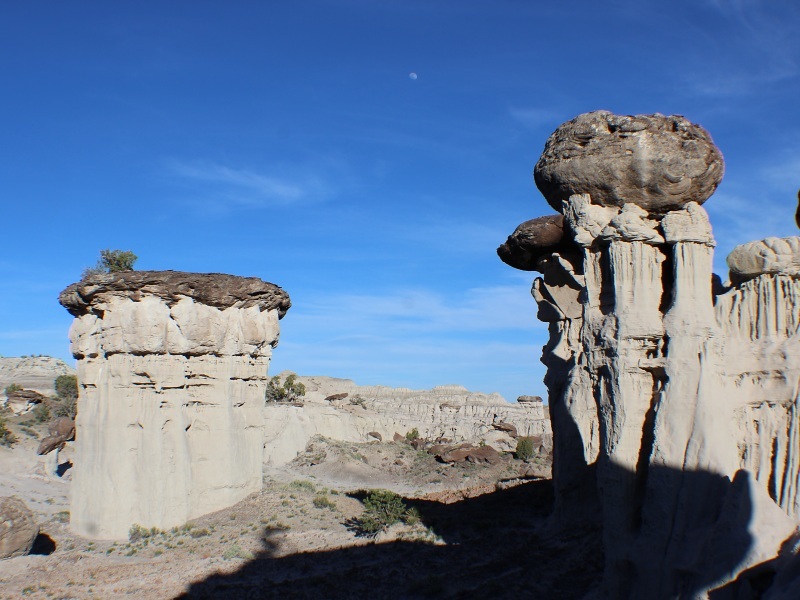 The geology of the region is more diverse than it's counterpart the Bisti. 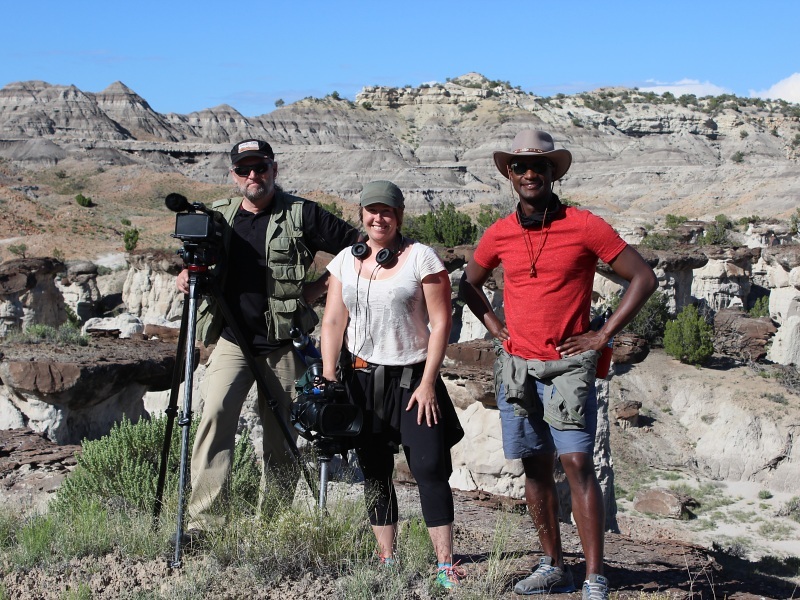 Here in the northern region remains the Nacimiento Formation which formed during the Paleocene Period, long after the dinosaurs vanished. 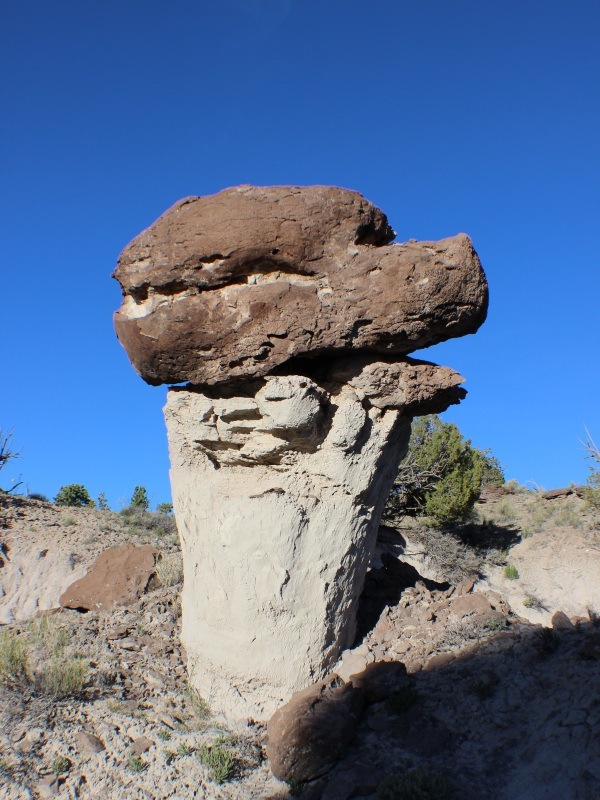 Erosion from the northern San Juan Mountains helped strip away the southern portion, exposing the lower Kirtland and Fruitland Formation of the Cretaceous Period. This southern area is characterized by rolling mounds of mud and siltstones with interdispersed sandstones. 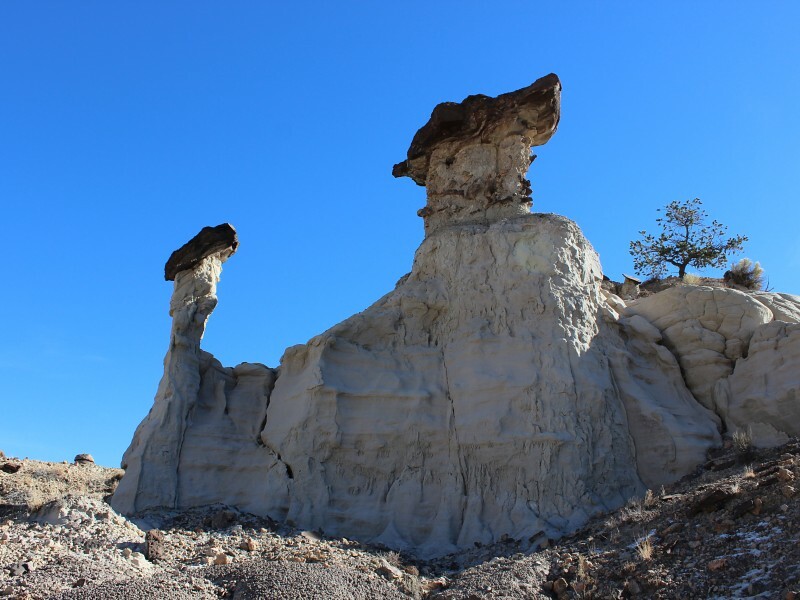 Hoodoos in Lybrook are massive in comparison to those in the Bisti. 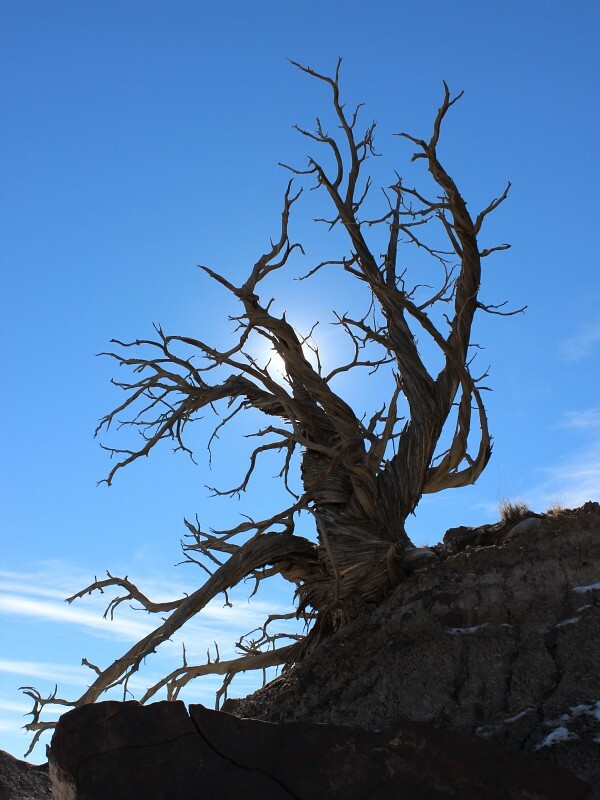 As the name suggests, fossil remains of animals, prints of leaves, and even whole branches and trunks of trees are common in the area. 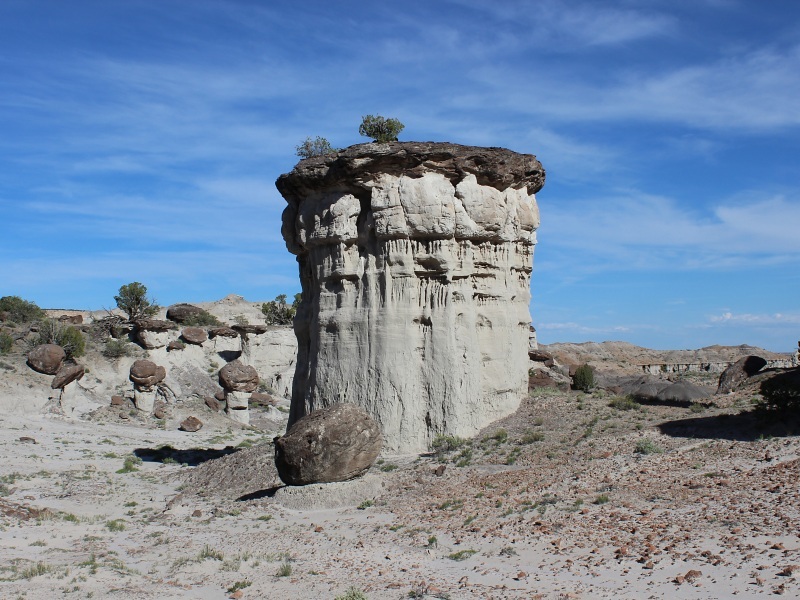 If you are interested in fossils, you can collect a limited amount of fossils of plants, insects, shell and petrified wood on BLM land. Under Federal Law, you CANNOT collect fossils of animals with bones (vertebrates). 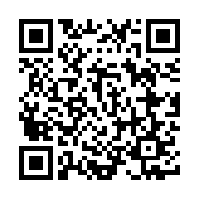 You may not sell any fossil that you collect from Federal land. 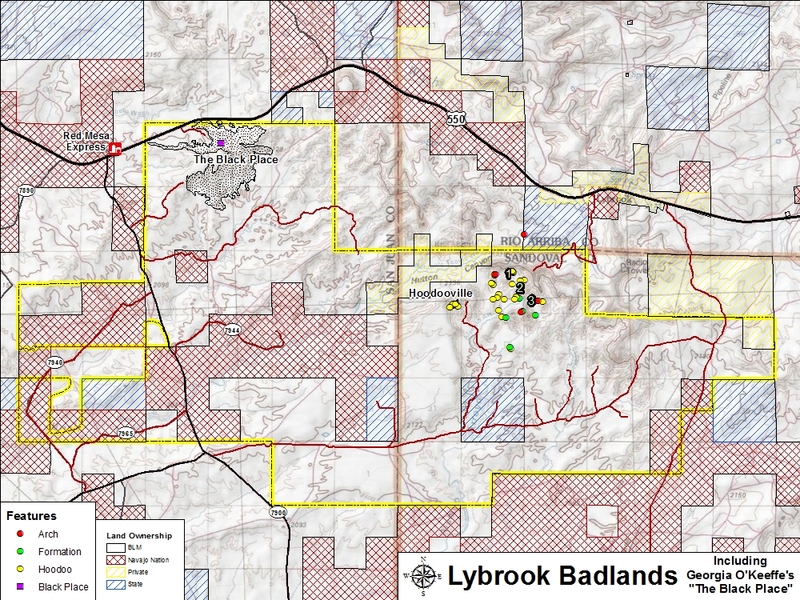 There are no facilities located in the Lybrook badlands. Pack out what you pack in. Visitors need to be aware that roads may become impassible during inclement weather. In addition, there is extensive use of oil and gas field trucks in the area and these vehicles have the right-of-way.